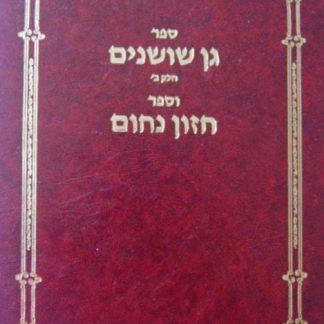 Gan Shoshanim volume 1 is a collection of essays in Hebrew, by Rabbi Menachem Genack, Rabbinic Administrator of the Orthodox Union’s Kashrut Division, on subjects relating to Seder Moed and Shulchan Aruch, Orach Chaim. Shoshanat HaAmakim is a collection of essays by Rabbi Genack on Talmudic topics. The two books are bound together in one handsome volume that includes letters of approval and/or recommendation from Rabbi Joseph B. Soloveitchik, Rabbi Moshe S. Shapiro, Rabbi Ovadiah Yosef, and Rabbi Yitzchak Kolitz.